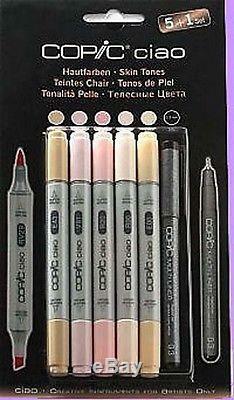 PRODUCT : COPIC 5+1 PEN SET - SKIN TONES. The Copic Ciao is an affordable marker range ideal for art, craft, design and manga. Equipped with both a medium broad and a super brush nib, Copic Ciao markers can be mixed on the surface or layered over each other. Copic Ciao markers are alcohol based, non-toxic and fast drying. This great value set includes 5 carefully chosen colours, plus a Copic Multiliner 0.3mm fineliner pen for those all important outlines and details. The Multiliner was specially developed for sketching, and when over-drawing with COPIC Markers the tracing line remains sharp and does not bleed. Skin Tones: E43, V91, R20, R00, E00. ABOUT US : Bargainartistshop is the online sales name of The Paper House, Stafford. Established in 1984, we aim to offer premium brands at bargain prices. All our products are new and unused. We operate from our own modern site with a showroom and 9000 square foot warehouse. This does not include weekends and bank holidays. This time may increase during the run up to Christmas and during other busy periods. DELIVERIES NOT RECEIVED : If your order has been despatched but has not arrived in the time stated, we request that you check with your local sorting office. Our statatistics show that 95% of missing parcels turn up this way! The item "Copic Ciao 5+1 Marker Pen Set Skin Tones" is in sale since Wednesday, September 28, 2011. This item is in the category "Crafts\Painting, Drawing & Art\Drawing Supplies\Pens & Markers". The seller is "bargainartistshop" and is located in Stafford, Staffordshire. This item can be shipped worldwide.